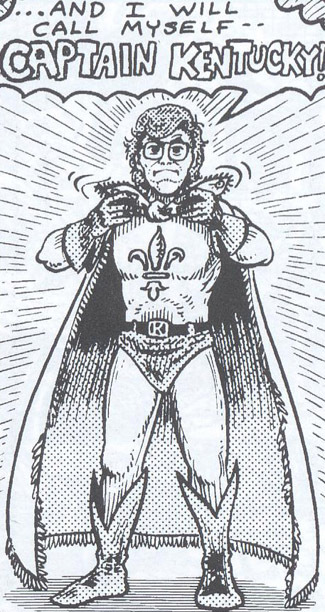 Here is a long introduction to Don Rosa's super-hero comic strip, Captain Kentucky. 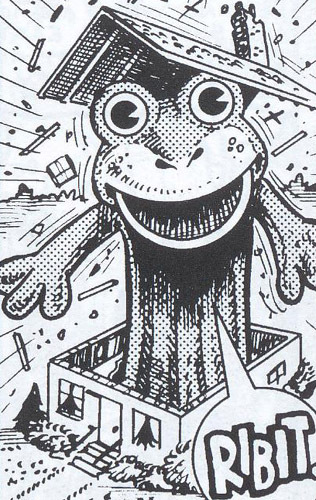 If you only want to know basics of Don's non-Disney comics, you should read Don Rosa's long introductions' Non-Disney comics -part. 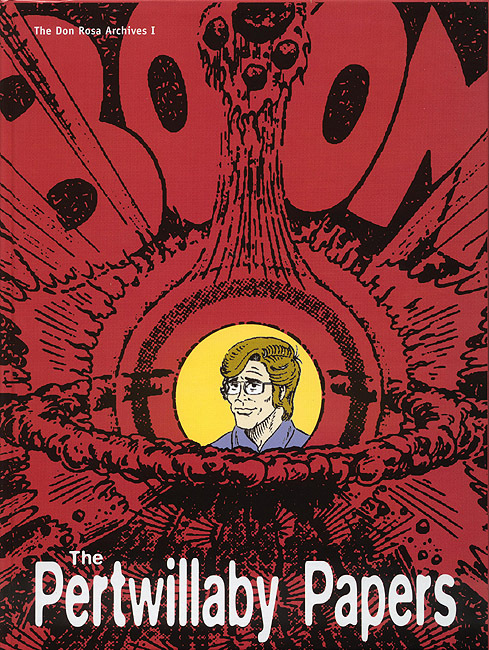 Already in 1979 Don Rosa was quite famous in his home area, Louisville, Kentucky because of his own comics, comic collection and TV and movie knowledge. 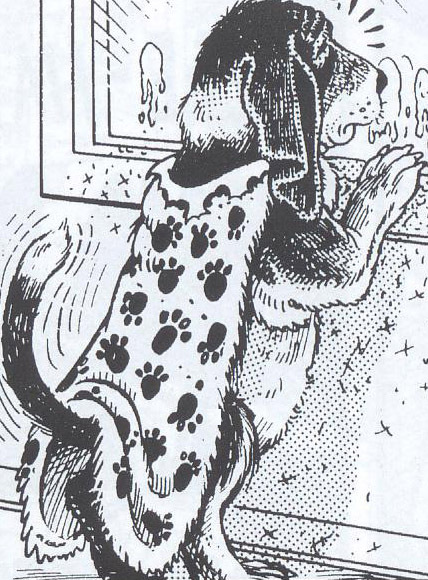 So, when the local newspaper Louisville Times' Scene-section's editor, Greg Johnson, decited to publish a comic strip by someone local, he contacted Don Rosa. This might also have something to with the fact that Scene's television columnist was a friend of Don, Ray Foushee. Don wanted to make his Pertwillaby Papers -comic's main character, Lancelot Pertwillaby, a superhero and to do about it a Sunday-size comic strip, which meant that the strip would be published as two tiers of panels. The intention was to create a fast moving and funny comic, that would include local celebrities and places. So, in 6.8.1979 was published the first Captain Kentucky episode in Louisville Times' Saturday's Scene-section. And there it appeared every Saturday for the next three years. 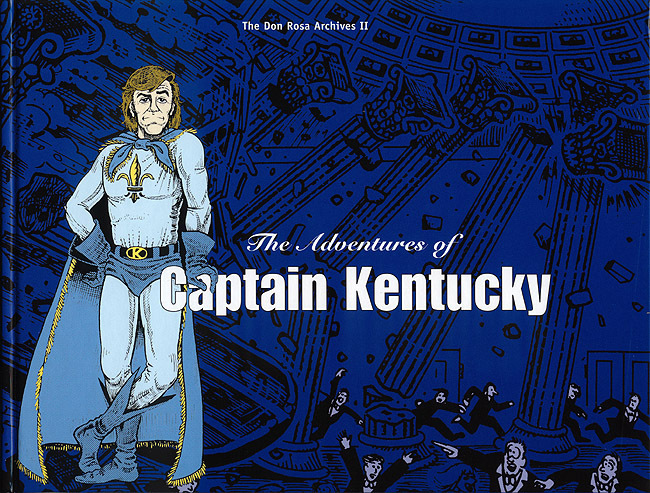 Captain Kentucky is a parody of superhero comics, because Don never really liked them, excluding mayde the 1940's and 50's and the 1960's beginnig's superheroes. It's a unique comic, because it's the only comic strip that appeared in a major American newspaper (Louisville Times was widely respected paper) and, that included actual living persons and places. Don also used Captain Kentucky to express his own opinions, as from episode 25 he wrote between the two tiers of the strip his own thoughts. Captain Kentucky had adventures that were many episode long, in which Captain Kentucky tried to fight againts anything that threatens "truth, justice and the American way". Although he usually failed and destroyed part of the city in addition and for a long time he remained unknown to Louisville and those who knew him didn't respect him, on the contrary, they thought of him as a thread. In his fights against evil Captain Kentucky faced the most exordinary enemies, for example Nuke Duke and Captain Kentucky's most popular enemy J. Fred Frog, a gigantic hand puppet revivaled by Presto the Magic Clown. All kind of weird stuff also happens to Captain Kentucky, like beeing selected to the mayor of Louisville, getting the city on depts and boxing with Mohammed Ali. Captain Kentucky is a very traditional superhero: he has his own origin story (Lance Pertwillaby changes to Captain Kentucky by drinking "octa-hexa-glop", a radioactive waste, that he has a full drum on the roof of First National Tower), his own suite and from episode 120 even his own sidekick, Captain Cleo, who is Lance Pertwillaby's basset dog's superhero-alter ego (Don Rosa really had a basset called Cleo during the making of the comic). Captain Kentucky wasn't very popular and Don made it only for his own joy, even if he did got payed for it. But he only got as much as some critic would get from a review that it would take a hour to make. But it took over 12 hours for Don to make one episode and after making the strip for three years he decited to stop making it, because it just wasn't worth it anymore. So, 15.8.1982 Don draw Captain Kentucky's death into episode 150. After stopping the making of Captain Kentucky Don made one more Pertwillaby Papers episode (141), that begins when Lance wakes up and realises that his superhero career had just been a weird dream. A Norwegian Gazette Bok-publishing firm published in March of 2001 two hardcover book under the name The Don Rosa Archives: The Pertwillaby Papers and The Adventures of Captain Kentucky. The books are in English. The Adventures of Captain Kentucky -book includes all the 150 episodes of Captain Kentucky and Don Rosa's and professor of history Øystein Sørensen's forewords. There is also a special limited edition of the books that includes both of the books singed by Don and a poster. The picture in the poster is the only scene where Captain Kentucky and Lance Pertwillaby ever met. 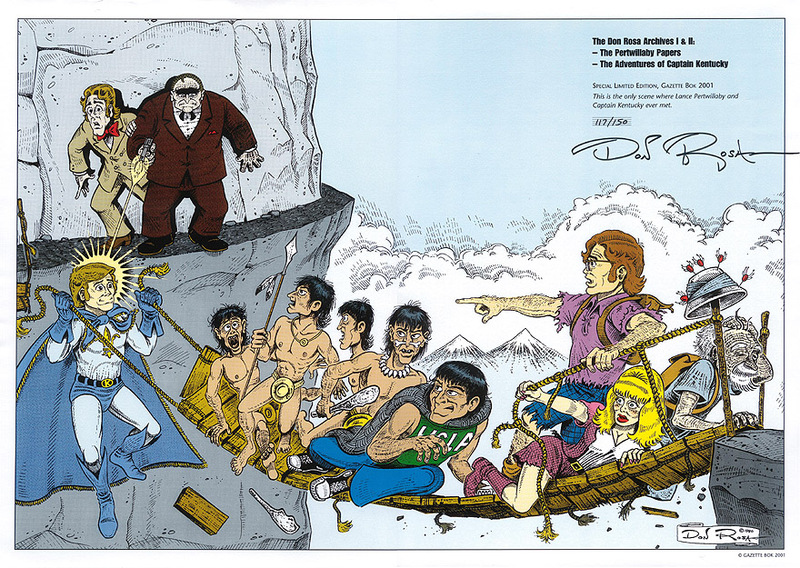 The poster also is singed by Don and there is only 150 issues of it. You can order the books from here, but in Finland they can also be found from Akateeminen kirjakauppa and Suomalainen kirjakauppa.